Today is the 14th Annual "Winter Bike to Work Day." DNAinfo Chicago recently posted an informative article by Alisa Hauser, who interviewed Chicago “Winter Warrior” bicyclists willing to share survival tips while cycling throughout the Windy City even in the midst of winter. The article features Keating Law Offices very own attorney, Michael Keating, and administrative assistant, Hannah Zenke. According to Ms. Hauser’s article, Active Transportation Alliance estimates that 8,000 people use a bike to commute in Chicago during the winter, including KLO’s Hannah Zenke. Hannah commutes 10 miles daily from her home in Logan Square to Downtown. Hannah really enjoys biking for both her mental and physical health. “It’s a way to beat the seasonal depression, it’s totally a real thing…Exercising in any way shape or form will release serotonin. You get a good feeling afterward. Just the fact you are a winter warrior and you made it to work, it’s a high-five, it makes you feel like a badass,” Hannah told DNAinfo Chicago. Hannah stays warm while biking by wearing a wool onesie underneath her clothes, Pearli Izumi tights, two pairs of gloves, a face buff, and goggles to keep the snow out of her eyes. If Chicago cyclists want to feel good while surviving as a winter warrior like Hannah does, her pro tip to fellow cyclists is to wear layers. While you layer up for Chicago’s snowy winters, keep in mind that you may want to wear some reflectors on top of your layers, that way motorists can see your hand and arm signals that are required by Illinois law. The Illinois Vehicle Code states that any person operating a bicycle upon a roadway at less than the normal speed of traffic at the time and place and under the conditions then existing shall ride as close as practicable and safe to the right-hand curb or edge of the roadway…except (iii) when reasonably necessary to avoid conditions. 625 ILCS 5/11-1505. Because of winter weather conditions in Chicago, cyclists may find themselves traveling at a lesser speed than what they are normally used to during the hot, sunny summer days. This Illinois law takes into consideration that there may be certain conditions that prevent cyclists from biking as close and safe to the right-hand curb as possible while traveling at a speed less than the normal speed of traffic. 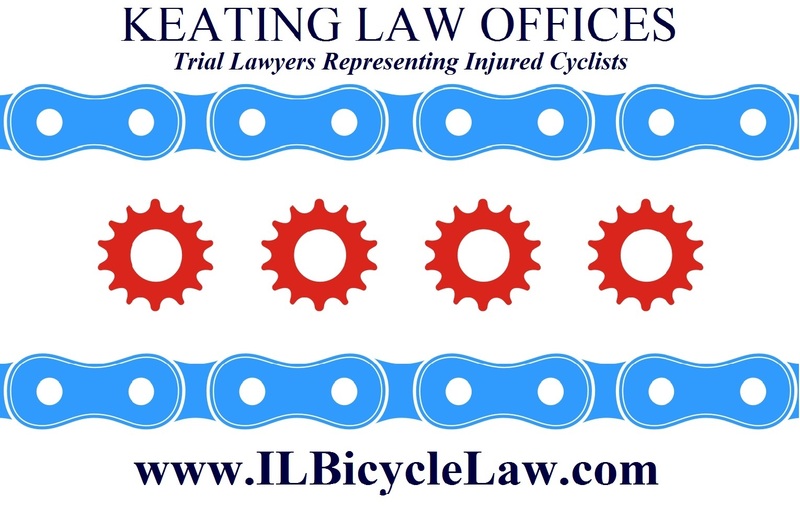 Attorney Michael Keating of the Illinois Bicycle Lawyers at Keating Law Offices told DNAinfo Chicago his biggest concern in the winter months is that drivers don’t expect to see cyclists on the road. The road is narrower due to snow removal and cyclists do not have as much room. Section 9-36-010 of the Municipal Code of Chicago requires that the operator of a motor vehicle overtaking a bicycle traveling in the same direction on a highway shall leave a safe distance, but not less than 3 feet, when passing the bicycle and shall maintain that distance until safely past the overtaken bicycle. This law is often referred to as the "3-Foot Rule." Illinois Vehicle Code requires that “every bicycle when in use at nighttime shall be equipped with a lamp on the front which shall emit a white light visible from a distance of at least 500 feet to the front and with a red reflector on the rear of a type approved by the Department which shall be visible from all distances from 100 feet to 600 feet to the rear when directly in front of lawful lower beams of headlamps on a motor vehicle. A lamp emitting a red light visible from a distance of 500 feet to the rear may be used in addition to the red reflector.” 625 ILCS 5/11-1507 (a). So, when riding a bicycle at night in Illinois, cyclists must have a white light equipped on the front of their bicycle with a light visible from a distance of at least 500 feet. In addition to that front light, the cyclist must have an approved red reflector on the rear of his or her bike that is visible from 100 to 600 feet by a car with its headlights on. In addition to the red reflector and if the cyclist chooses, a red light may also be equipped on the bicycle’s rear with a light visible from a distance of 500 feet. Attorney Keating suggests that cyclists use as many lights as possible because visibility is very poor during Chicago’s winter months. A headlight will give cyclists a greater visibility while riding, making your ride home compliant with Illinois law and much safer. 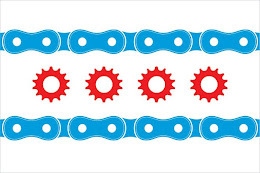 Although Chicagoans know the frigid temperatures, wind chills, and snow and ice storms that so often happen during the winter months here in Chicago, the key to staying safe and warm as a cyclist is to layer clothing, be a defensive cyclist, and follow the regulations provided by Illinois law.